Focus is the key to happiness! Practicing yoga is a practice of focus. Attending to your breath on the yoga mat brings you to the present moment. Thoughts about laundry piling up and birthday parties to plan disappear. Relaxation of body and calmness of mind follow in the wake of mindful breathing. The yoga practice teaches you how to breathe mindfully on the yoga mat. The fruit of the practice is taking that mindfulness of breathing off the mat and into all of our activities. At first, mindful breathing off the mat is a conscious practice, just as it is on the yoga mat. With continual and consistent practice, it becomes habitual and unconscious, just as it does on the yoga mat. Relaxation and calm seep into more and more of all of your daily activities as the habit becomes ingrained. With a firmly established habit of mindful breathing, the relaxation and calmness which often accompanies a yoga practice can also serve as the foundation for a calm and relaxed life. It all starts with focus, bringing the mind to the breath. Focusing the mind, or one-pointed concentration, in yoga is called “dharana”, and is one of the eight limbs of classical yoga. In asana practice, it is also practiced with the gaze. A steady gaze in yoga is called “drishti”. Dharana can also be practiced with the breath as the object of attention, or with a tight hamstring, or with a concept — like gratitude or generosity. There is a long tradition of practicing dharana by using a candle as the object of concentration. We do this at the Dhira Yoga Center the last Friday of every month with “Candlelight Flow”, a yoga asana practice followed by a 15 minute one-pointed concentration on a candle. It’s a key part of the practice of classical yoga. With practice, it can serve as the foundation of a steady and happy life, even when doing the laundry and planning birthday parties! Come join us tomorrow night for Candlelight Flow at 6pm. Be content with following each breath in your practice. There is no finished pose to strive for. If you think you arrived, you lose the jewel in the lotus, a much more splendid treasure hidden in each breath! This Friday, Dhira offers its first Candlelight Flow Class with Rebecca! If you are so ready to relax and unwind from the work week, stop on the way home Friday night, join us for a candlelit, gentle, flow class. 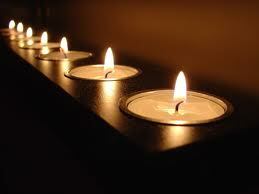 In our cozy, candlelit studio, this tranquil class will warm, restore and rejuvenate your heart, mind and body. Class ends with a guided meditation. 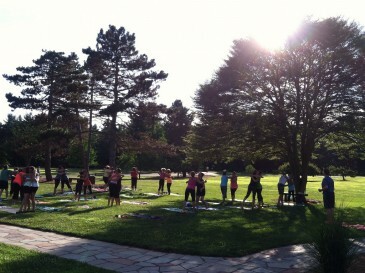 Don’t miss Rebecca’s 5:45 pm Candlelight Flow. This class meets only on the last Friday of every month. Don’t miss it! All levels. 75 minutes. Beginner’s Workshop — Sign up now — Only six spaces left! Dhira Yoga Center has six spaces left in their Beginner’s Workshop. This six week workshop is designed to be an enjoyable introduction to yoga. These intimate group experiences offer a safe and inspiring setting to begin your yoga journey. You will leave the workshop understanding basic yoga techniques, foundation poses, breathing exercises, a brief introduction to the history and philosophy of yoga and an introduction to meditation. The workshop will provide the tools to help you feel confident in our scheduled classes. Begins Saturday, February 16 and runs for six consecutive Saturdays from 1:00 -2:00 pm. Sign up now to reserve your spot! Details on Grand Opening Weekend Celebration! Grand Opening Weekend Celebration is only 10 days away and its going to be fun! On Saturday, February 2 and Sunday, February 3, Dhira offers three free classes each day. Please join us for this most auspicious weekend, as we celebrate the birth of a beautiful new home for an already blossoming yoga community! Please arrive 15 minutes before the start of class to familiarize yourself with our center and to stake out a spot for your yoga mat (or one of ours, if you don’t have one). Dhira Yoga’s teachers, over the course of Grand Opening Weekend, will be on deck to meet, greet and share in the excitement. Also, don’t miss out on our “GrandOpening” promotion discount on all purchases made before February 4, the end of Grand Opening Weekend. You can take advantage of this right now online by applying the promotion code “GrandOpening” when you “Checkout”. Check out our brand new Facebook page while your at it! On February 2 and 3, we begin our quest to build together a nurturing, flourishing, happy and healthy community dedicated to compassion, and cultivating peace, both in ourselves and in the world. And, to having a lot of fun in the process! Be there at the birth of Dhira Yoga! Oh, and don’t forget that starting Monday, February 4, our regular class schedule with over 20 classes a week, plus meditation and healing arts appointments begins! Om Shanti!